Larger and faster than the Bad Dog, these canine Heartless can be tricky to subdue. Their weakness to magic makes that the optimal solution. TIP: Moon-based attacks like their bark can silence you, preventing you from hurting them with magic. The Snapper Dog is an Emblem Heartless that is found in Kingdom Hearts 358/2 Days. A Snapper Dog resembles a large, bright green dog with a massive head and an equally massive, toothed maw. Its ears are long, stand on end, and curl at the tips. It has a crooked, green tail and four short legs with no discernible digits on its paws. Its long, red tongue is often seen hanging out of its mouth. The Snapper Dog's large, yellow eyes each sport a black spiral pattern. 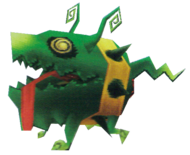 It also wears a large, yellow collar with several conical, dark green spikes on it, though, because of the Heartless's size, it is worn around its waist instead of its neck. Its nose, paws, and the tip of its tail are all light green. Its Heartless emblem is on its rear. The Snapper Dog's name refers to its canine appearance, as well as its powerful bite—"snap" can mean "bite". Snapper Dogs will utilize two attacks when encountered, one being a long-range, damaging bark attack, the other a biting attack. The biting attack can be Blocked to stun these Heartless, opening them up to more damage.